DISCOUNT CARDS ARE NOW AVAILABLE TO PURCHASE!! $25 each. This discount card can be used to receive an extra 15% off your purchase throughout the year of 2019! Sometimes it can also be combined with special sales to receive a larger discount! Classes must be paid as you sign up. If you call in to sign up, a credit card payment will be accepted. If you come in to The Golden Needle, a credit card or check is accepted. We appreciate your cooperation so classes can be scheduled and instructors can plan for the class size. If you are a proud owner of a new machine please check the calendar and select your free new owners class for a date that fits your schedule. Please call the Golden Needle and reserve your place for that date. Remember to bring your machine! Classes for know your machine and software operations lasting 2 -2 1/2 hours, led by a professional will be a charge of $100 for those who did NOT purchase their machine at THE GOLDEN NEEDLE. If a repeat of a session of a software program is required there will be a charge. April 22nd Embroidery on Cork. 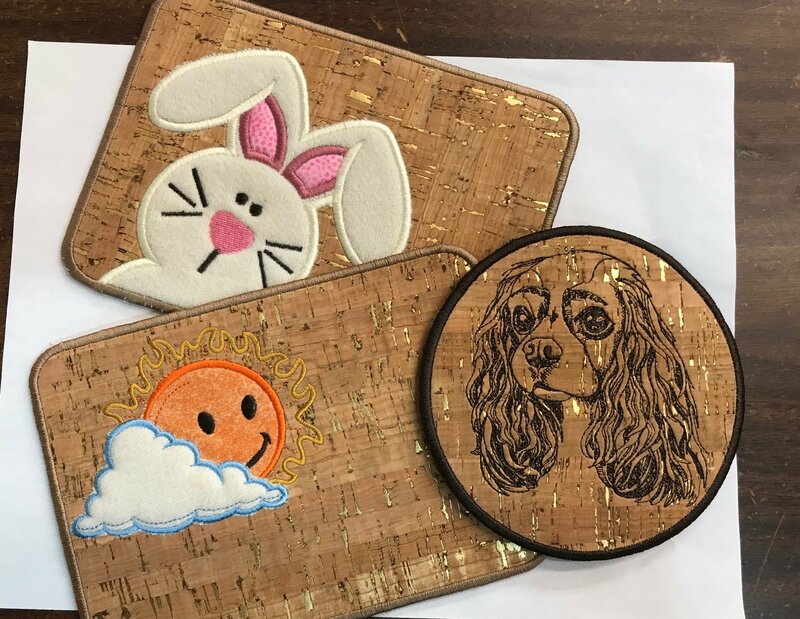 you will need your embroidery machine and a 5 x7 or 4 x 4 hoop. See the rest of the supply list on the Calendar! April 24th. Our shop is located in historic Cape Girardeau, Missouri. Cape Girardeau, founded in the late 1700’s, is on the west bank of the Mississippi River 115 miles south of St. Louis and 160 miles north of Memphis, Tennessee. For more information please visit Cape Girardeau's website.The Golden Needle is located 1 mile east of Interstate 55 at exit 96, then east onto William St (Hwy K), then right onto Kingshighway approximately 1 block - (look left for store). We are a sewing machine and quilt shop featuring nearly 3300 bolts of popular fabric lines We have a large selection of books, notions, patterns, kits etc. We are proud to offer clubs, classes and special events which appeal to a variety of customer tastes. The Golden Needle has been in operation since 1981, selling and servicing sew machines. The addition of the Sew Basket Quilt Shop was purchased in 2006 and moved to the current location. Since then, the fabric selection of brands and designs had been expanded. In addition to quilting supplies and classes, we are a full service dealership for Bernina, Brother and Janome, Sewing and Embroidery Machines, as well as Quilting frames and machines. Additionally, we carry The Brother Scan 'N Cut, as well as the vinyl and other supplies and classes needed to enjoy projects with this creative system. Our staff and teachers have expertise in piecing, machine and hand quilting, appliqué techniques, color and fabric selection as well as years of experience in quilt making. Vacuum Cleaners - We have a wide range of Riccar vacuum cleaners. These uprights are MADE IN THE USA. They have full size and a lightweight machine - 8 lbs and also canisters.